These were not quite as loud as I was hoping for but it's alot better than the factory. Slipped on easy and both pipes had rear hanger bracket in perfect spot. Only had to slide heat sheild forward a bit on the one side. Nice looking and and fast shipping. Cobra has done a fantastic job with the Neighbor Haters for my 2018 Road King. Looked at the other big two companies and found the Neighbor Haters at half the price does a fantastic job. They're not too loud but loud enough to sound like a Harley and let other drivers know you're there. The sound is 100% better than the stock pipes. The final advantage is the price: HALF of the other slip-on mufflers I reviewed. Final conclusion: Not too loud, sounds great when cruising and accelerating and a savings of hundreds of dollars. There is no sacrificing of quality with the COBRA Neighbor Haters. Awesome sound great looking fits perfect.. Pipes sound awesome...easy install. No tune, no back pop. Fit, finish, price, and sound are all GOOD. Happy with the sound of these pipes, not to loud. (just the right sound for a Harley) I would highly recommend. Love everything about these mufflers. Fit, finish, sound! I have had several Harleys all different year/models. I Imagine they would sound a lot better without the cat still on the bike. I felt as if it had a "tinny" sound. Didn't give the Harley rumble that I was hoping for. I put a hundred miles on them and sold them. I went with what I know and trust Vance and Hines, much much better! They look good and the fitment was great, for the money it is better than stock just not what I wanted. They are not as loud as I expected, they're ok. Neighbor Haters ? My neighbors love it !!! They are perfect. Not too too loud, but just loud enough to get other motorists attention out on the road. Fit was perfect as well as sound. They sound a little different on the M8 motor then on a twin cam. great fit. do yourself a favor and change the right muffler first as this is the one that takes the most time. a tight fit but that is what you want. the left muffler is a breeze as others have mentioned. bike seems to have a little more power but that could just be me. definitely have the Harley sound back and people now turn to notice when before they couldn't hear me coming. if you want that deep rumble then these are the mufflers for you. 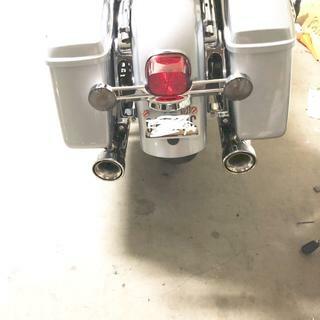 I drilled out the baffles on the stock HD pipes and it was an improvement but still too quiet. With these cobras, it is noticeably louder. The only way to get more sound would be to change the head pipes or remove the cat. I will leave as is for now, quite satisfied. Love my chrome Cobra neighbor haters. They have that awesome, aggressive growl that’s not too overwhelming but just right. Easy to install...took maybe 15 minutes and I was on the road. Highly recommend! They sound awesome, fit perfect very satisfied with service and product. The left muffler slipped on, while the right muffler was way to small to "slip on". A big rubber mallet was needed, but worth the effort to save hundreds on the pair. They didn't sound loud enough initially, but after some burn-in, they became louder. I'm happy with my purchase. I was hoping they would be loader, a little disappointed but has nice style and great value. Is fuel management needed for these slip-one? BEST ANSWER: No but to get the full benefit of them yes. I added the cobra fuel management when I added the NH pipes on my 2017 street glide. Retail is $429.95 as of 2/2/19. How can you offer them for such a discount??? Will they fit with extension? BEST ANSWER: they fit perfectly on my '17 RGS. I'm not sure what you mean by extensions unless you are trying to make you pipes longer. I would think that as long as your pipes have the same diameter on exit as the inlets on the mufflers they should work. The inlets are 2 different sizes on the mufflers left to right. question cannot be answered without knowing details of what bike they are going on, or what kind of extension the question is referencing. Not sure what extension you have. The 2017 street glide changed the right side exhaust size. I already have the Neighbor haters (#6109) on my stock headpipes. My question is will it fit these? BEST ANSWER: Not sure,I would call the company u r going to order from and ask them,they probably will fit. I have them on my 2017 Street Glide.